Conflict is on the rise globally, and it’s the single biggest driver of humanitarian needs today. 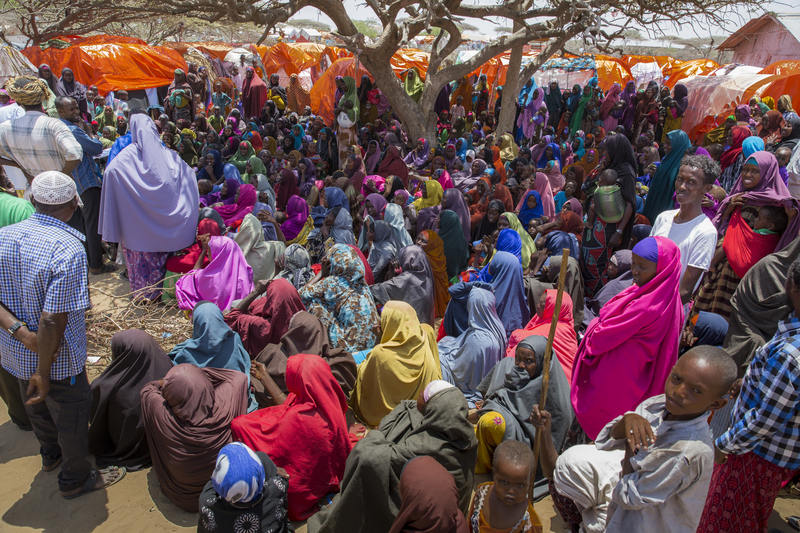 Dr. Caitriona Dowd, Concern’s Humanitarian Policy Advisor, explores the links between conflict and humanitarian crisis… and the urgent imperative to build peace. 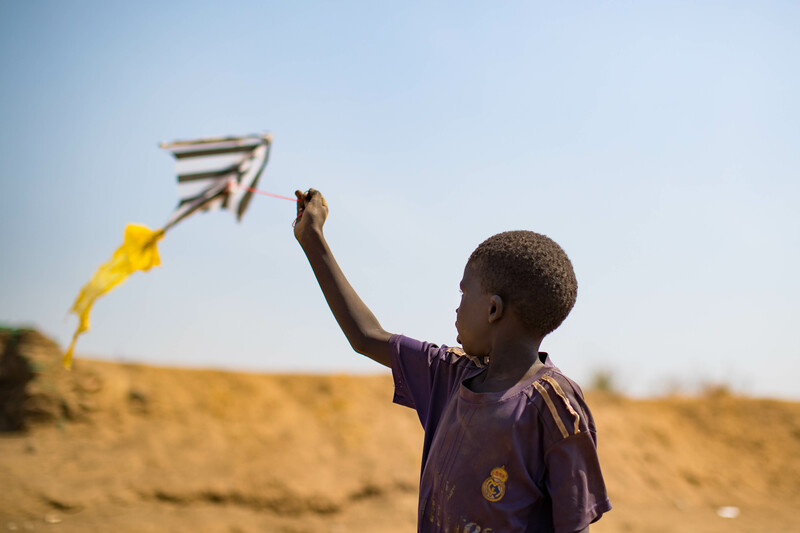 A child flies a homemade kite in a displacement camp in Juba, South Sudan. Photo: Steve De Neef / Concern Worldwide. Around the world, violent conflict is increasing. After several years of growing global peace, violent conflict has significantly increased in the past decade. By some estimates, the number of countries involved in violent conflicts is the highest in three decades. Not only is conflict increasing, but it is also the single greatest driver of humanitarian crisis today. Over 80% of humanitarian funding goes to conflict-affected contexts. Over the course of the past year, I worked with Concern teams in Afghanistan, Central African Republic, Haiti, Lebanon, South Sudan, Somalia and Syria, to better understand how conflict affects communities, and to document and share how conflict is experienced by people closest to crisis. The accounts the teams and I collected are shared in two thematic studies on Conflict and Displacement and Conflict and Hunger and in Concern’s new report, Breaking the Cycle. 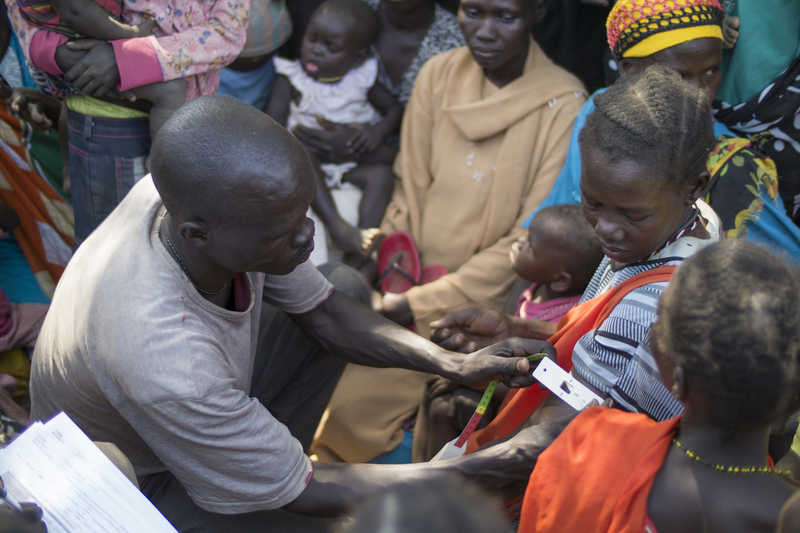 Conflict has a devastating impact on food security and displacement in areas of acute violence. These impacts are devastating and long-lasting. In Somalia, Faduma* recounted her experience of years of intermittent sieges by armed opposition groups on her town, restricting trade, population movement, and humanitarian access. In Syria, shifting front lines mean Laila* and her children have been displaced six times in as many years, in a near constant search for safety. Displaced families collect SIM cards for emergency cash phone transfers from Concern Worldwide at a displacement camp in Mogadishu, Somalia. Photo: Kieran McConville. But conflict also affects communities in less visible, sometimes hidden ways, transforming (and often destroying) economies, social networks and household support systems far from the front lines. In South Sudan, community members described how local systems for mutual support, solidarity and reciprocity had broken down in the face of unprecedented crisis. Even in areas far away from the front lines of fighting, like Aweil North, in the north-west of South Sudan, the impact of the national crisis is affecting them in similar ways. A group of male farmers spoke about their lives before the crisis. These changes in the way communities help and support each other can have a long-term impact on resilience, coping strategies and development long after conflict is over. To make progress on Sustainable Development Goal 16, of promoting peaceful and inclusive societies for sustainable development, we must tackle conflicts complex and multi-faceted drivers and consequences, including the damage done to social structures. While conflict can be devastating for entire households, communities and even countries, it also has different impacts on different groups. Conflict affects women, men, youth and people from vulnerable groups in starkly different ways that often reinforce existing inequities. *Bernadette from Kouango, in CAR Photo: Caitriona Dowd / Concern Worldwide. Men’s and boys’ experiences of conflict and displacement are also profoundly gendered, and include being severely restricted in their mobility and targeted for forced recruitment. Men also reported deep-seated feelings of shame and helplessness in the face of their own perceived failure to provide for and protect their families. Empowering women is an urgent and important step to address these inequalities and begin to change damaging patterns of gendered violence in conflict. But women cannot, and must not be asked to, bear the burden of social change alone. Men must be engaged as allies in the fight against gender-based violence and harmful gender roles, and in the work of truly transforming gender relations. The stories of communities whose lives were destroyed by the last civil war are a stark reminder of the cyclical nature of many conflicts, and the importance of understanding the historical, as well as political and social context, of a crisis. The threat of slipping back into violence is also a lasting legacy of conflict. To this day, many in the town maintain that friends and neighbors remain away out of fear. As one woman said “only the brave came back”. The accounts shared by individuals throughout Concern’s new report demonstrate the urgent need to respond to conflict, address its impacts, and work with communities to resolve and prevent it. Often, this task can seem monumental. However, when rooted in evidence and best practices, supporting locally-owned peacebuilding initiatives can have a profound impact on communities’ chances for a more peaceful future. In Central African Republic, for example, Concern is working with communities to establish or re-engage structures at local level for managing conflicts. In some cases, these existed before the crisis, but were destroyed in the subsequent conflict. 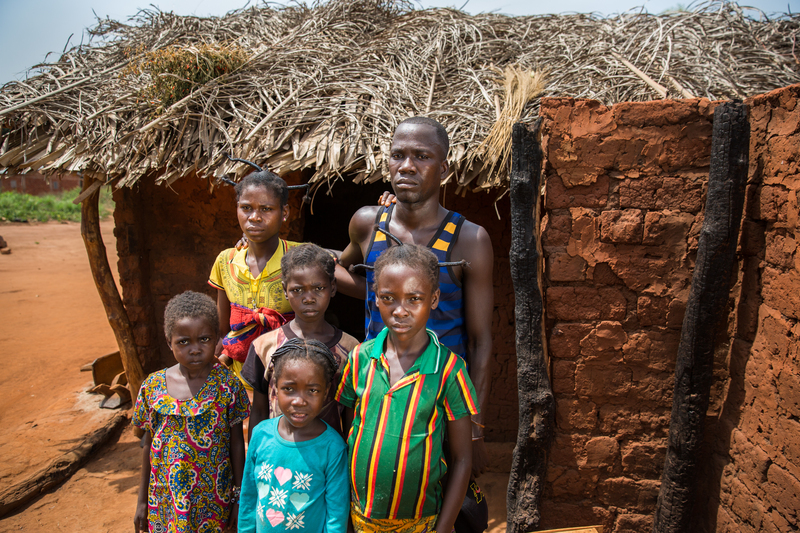 Lidi and her family outside their rebuilt home in in Kouango, Central African Republic. Theirs was among hundreds of houses burnt down in a rampage of violence. The charred roof posts of the old structure are still visible. Empowering communities to rebuild inclusive institutions after violence can be a vital step in re-establishing peace and rebuilding social cohesion. As part of a five-year program, committees will be trained in mediation skills and non-violent conflict resolution. Beyond conflict management alone, community structures will also be trained and supported in initiatives to reduce gender-based violence and environmental vulnerability. Integrated approaches of this kind, that recognise the complex, unequal and often gendered consequences of conflict, help the whole community enjoy the dividends of sustainable peace. Reinforcing systems for more effective, sustainable, and inclusive conflict management. In its 50th year of tackling crisis in the world’s most conflict-affected contexts, Concern is committed to doing more than ever to alleviate suffering; work with communities to address the root causes of poverty and vulnerability; and empower women, men, youth, and peace champions from vulnerable groups to build a better future for their communities.